Piano Lesson, 1983, collage of various papers with paint, ink, and graphite. The Walter O. Evans Foundation for Art and Literature. 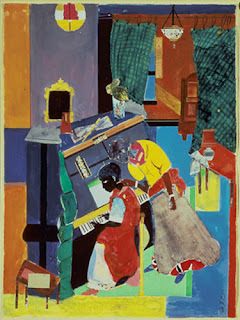 ©Romare Bearden Foundation/Licensed by VAGA, New York, New York.A year after Bearden completed this collage, he returned to the subject for his lithograph Homage to Mary Lou, a reference to the great jazz pianist and composer Mary Lou Williams (1910-1981). In 1990 August Wilson published the Pulitzer Prize-winning play The Piano Lesson, which was inspired by Bearden's collage of the same title. Like Bearden, Williams and Wilson had Pittsburgh connections.